My mom told me to judge people by the people they surround themselves with. By that standard, NJ Gov. Murphy’s Acting DEP Commissioner Catherine McCabe has not shown strength of character. McCabe made her first management move on Monday, naming Debbie Mans Deputy Commissioner. Mans is formerly head of NY/NJ Baykeeper – read DEP press release. There were more qualified, more accomplished, and more aggressive environmental advocate candidates that were bypassed in favor of Ms. Mans. McCabe’s move has generated favorable – and highly misleading by error, spin and omission – press coverage and cheerleading from the usual suspects in the environmental community, see: Appointment of veteran environmentalist marks shift at New Jersey DEP. 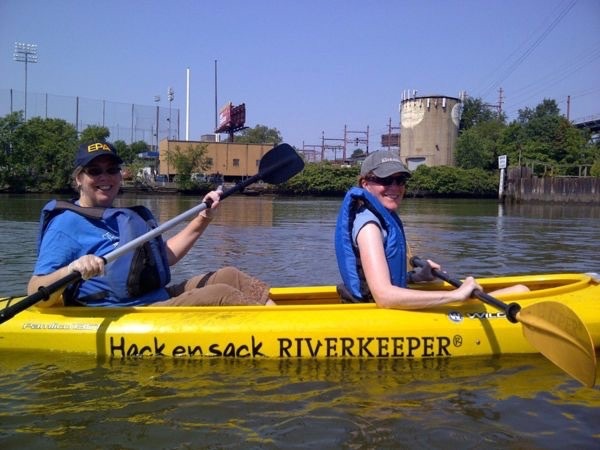 A longtime clean water advocate, Mans often battled the DEP under Christie, with efforts including a crusade by her organization to establish an oyster reef to clean polluted water in places like the Hackensack River. Hello! Funding your organization through largely ineffective window dressing feel good projects like oyster restoration is hardly the profile of a “clean water advocate”. While the DEP Deputy Commissioner position is more of a prestige than a policymaking position – the real DEP management team policy appointments are the Assistant Commissioners, especially the Ac’s for Environmental Regulation and Enforcement – still, it is important to note what the Mans selection signals for McCabe’s judgment and the direction of the Murphy DEP. So today, we flesh out the details that the media ignored and DEP press releases omitted or spun. Debbie Mans can hardly be described as a “veteran environmentalist”. She has had little statewide Trenton based legislative and regulatory experience as an “environmentalist”, has virtually no Statewide accomplishments, leadership, or policy victories, and has taken few personal or professional risks, in terms of speaking truth to power or advocating for significant or controversial policy reforms (or opposing bad things like privatization of the DEP’s toxic sites cleanup program, a policy dictated by her boss Gov. Corzine – or privatizing NJ’s drinking water and sewer systems). Mans’ few statewide efforts have either been faux grassroots projects manufactured by Foundations like Dodge (e.g. toothless CSO permits, and “urban water infrastructure” (cover for privatization, developer subsidies, and gentrification). These diversions allowed Mans to do NOTHING to oppose privatization of NJ water and sewer systems) or strategic blunders and abject failures (e.g. public access lawsuit attacking DEP’s regulatory powers). The Bergen Record cites Mans’ efforts in the Passaic River Superfund cleanup. Mans also was a force in getting the U.S. Environmental Protection Agency to approve a $1.4 billion cleanup of the Passaic River despite a strong lobbying effort by dozens of polluters for a cheaper alternative. But exactly the opposite is true. Mans supported the cheaper and less protective cleanup alternative! Mans compromised and supported a low cost partial cleanup – a cap – instead of a permanent cleanup and dredging and complete removal of contaminated river sediments, the remedial alternative advocated by community and environmental groups, like Sierra Club. 1) The EPA Superfund Record of Decision (ROD) considered and developed a cost estimate for a complete cleanup alternative. EPA rejected the far more costly complete cleanup in favor of a less costly and less protective cap. Mans supported that sell out by EPA. (caps are ridiculed by community and environmental advocates as “pave and wave”. The “environmental” position on cleanups is almost always in support of complete removal, known in regulatory jargon as a “permanent remedy”). Law360, New York (July 26, 2011, 7:31 PM EDT) — A New Jersey judge ruled last week that Occidental Chemical Corp. was liable for as much as $4 billion in costs related to the cleanup of highly toxic chemical pollution in the lower Passaic River. Her Trenton experience is primarily political, a former Corzine political appointment who was ineffective as a policy advisor to Gov. Corzine. The Patrol also has the backing of the Passaic Valley Sewerage Authority and Essex County Executive Joseph DiVincenzo, Jr.
Not one of the real clean water advocates I’ve worked with in Trenton for over 30 years was ever praised by sewage treatment plant operators. These advocates were the folks whose leadership brought real clean water protections from real laws and regulations with teeth, like the Clean Water Enforcement Act, the Highlands Act, and the Category One Waters stream buffer protection program. When the sewage treatment plants and local political machine hacks like Essex County’s Joe D. are praising your work, its because you are a bought and paid for chump, working on diversions and window dressing, not real clean water protections (which cost money!). 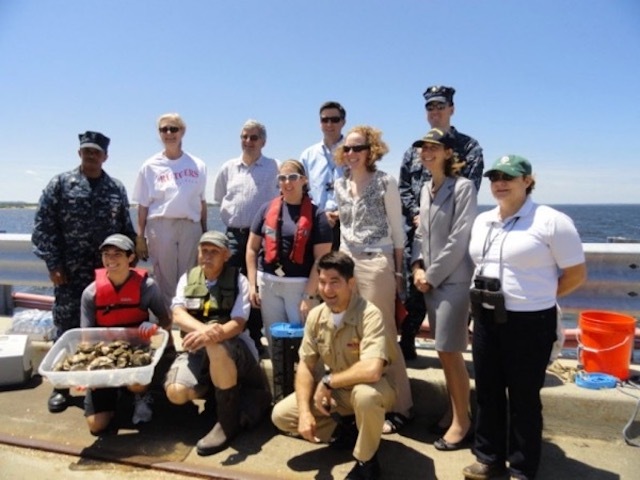 CRI administered $1 million in funding for an oyster restoration project in the Raritan Bay which was provided under a civil settlement with Chevron U.S.A., Inc. and the New Jersey Department of Law and Public Safety. The settlement arose from a February 2006 oil spill in the Arthur Kill, the strait separating Staten Island from New Jersey. From 2007 – 2014, this funding was used on NY/NJ Baykeeper’s Oyster Restoration in the Raritan Estuary Initiative. It funded the first stages of restoring oysters to the Raritan Bay including research and experiments that have shown that oysters can be restored to this area. Through their work in New York City and New Jersey, Baykeeper is showing that oysters can play a fundamental role helping filter pollutants and restore ecosystem function to the Raritan Bay and Hudson River Estuary. These types of civil settlements are quite common at the Federal level. Realizing this, CRI met with the US Attorney’s office in 2007 after they announced a big settlement in New Jersey that was to be awarded to NFWF, which, in-turn, was going to grant it to other non-profit conservation organizations in New Jersey. We met with the US Attorney in order to determine whether or not a local non-profit could play the role that NFWF typically plays in administering these funds. The US Attorney’s office could not provide an answer to us and it still remains unclear whether NFWF has a monopoly on this type of federal funding. I would describe Mans as a follower – not a leader – a loyal Democratic supporter, and a politically safe appointment. She began her NJ career at the Stonybrook Watershed. Former Watershed Director George Hawkins set the tone for that organization. Hawkins was widely criticized as a notorious opportunist, who put fundraising and political cover (for Gov. Whitman) above policy and principle, a fundamental flaw that Ms. Mans epitomizes. Shortly after that political photo-op, Ms. Siekerka spun the revolving door and rejoined her corporate friends as President of NJ BIA. For Mans to provide cover for Siekerka and the Christie DEP is an outrage. More recently, Mans has joined a corporate, politically moderate, and financially well endowed elite conservation faction that is led by Mike Catania of the Duke Foundation. That faction has formed other interlocking astroturf groups like the Keep It Green Coalition and the NJ League of Conservation Voters. These people are NOT activists or aggressive activists, nor are their organizations. They focus on funding their organizations and pet projects. Period. Basically, the purpose of this foundation funding driven KIG – NJ LCV project is to get Jeff Tittel and the “Trenton radicals” out of leadership and control of the political strategy and media message of the NJ environmental movement. Mans is at the heart of that “counter-revolution”. Mans is on NJ LCV Board. NJ LCV endorsed Murphy for Gov. [and spent $335,000 to help elect Murphy]. Her appointment creates the appearance of a quid pro quo – in NJ, that’s a violation of the State Ethics law’s “appearance” standard. DEP Commissioner McCabe worked for RA Enck at EPA Region 2 in NY. She has to be familiar with all this. Given all that, I see the Mans selection as another cynical move by this Administration to garner “green cover” and favorable media. This does not bode well for the much needed real substantive policy reforms, see: NJ Gov. Murphy Faces A Huge Challenge Reversing Christie Environmental Dismantling And Restoring DEP Integrity and Leadership. WolfeNotes.com » Who Put The “Poison Pill” Cap To Kill Renewables In Nuke Bailiout Bill? WolfeNotes.com » It’s March 1st – Do You Know Where Gov. Murphy’s Environmental Team Is? WolfeNotes.com » Do We Have A Hostage Situation At Murphy DEP?